Heritage Le Telfair Golf and Spa Resort - Repeater Offer: Stay 3 Times, Save 10%! Casa Velha do Palheiro is a five-star hotel, located high above Funchal, Madeira. This 1801 hunting lodge is set on the 300 acre Palheiro Estate, neighbouring Palheiro Golf Championship Golf Course. Casa Velha provides an excellent choice of restaurants. The Dining Room serves fine gourmet cuisine matched by an impressive selection of Portuguese and international wines. Alternatively the Club House offers a more casual setting serving a Mediterranean inspired menu to be enjoyed while taking in the panoramic views of the golf course, mountains and Atlantic Ocean. Additional bars, restaurants and shopping is located just 15 minutes away in the centre of Funchal. The Palheiro Spa, nestling in woodland a short walk from reception, features a veritable array of treatments and beauty therapies. Heated indoor and outdoor swimming pool facilities, plus a smart gymnasium, further enhance the well-being experience on your Madeira golfing escape. Hotel facilities also include an all-weather tennis court and croquet on the real lawn. Casa Velha Do Palheiro also offers excursions such as Big Game Fishing. The hotel also borders the world-renowned Palheiro Gardens – landscaped grounds that nurture an astonishing variety of rare and beautiful sub-tropical flora. Listed Golf Package prices at Casa Vehle do Palheiro feature Standard Garden Wing Rooms (28m2). Book Casa Vehla do Palheiro for Summer 2019 and receive a FREE Upgrade to Golf Wing rooms. Fronting the hotel's well-manicured back lawn, the architecture of the two-tier Golf Wing is very much in keeping with Casa Velha's country house-style appearance. The Double Golf Wing Rooms offer more floorspace and bathrooms with separate tub and shower. The floor-length rear windows allow glimpses of the golf course. Offer Conditions: FREE Room Upgrade may be combined with Group Offer (FREE Half Board). Listed Package Prices: Listed golf package prices apply with Free Room Upgrade for Offer dates. Listed Golf Package prices for include daily breakfast as standard. Groups of 6+ golfers at Casa Vehla do Palheiro staying at least 7 nights receive FREE Hotel & Golf for Group Leader. Offer Conditions: Group Offer may not be combined with any further Group Discount at Casa Vehla do Palheiro. Listed Package Prices: Listed Golf Package prices apply with Group Offer for every group of 6 Golfers. Enjoy Unlimited Golf at Palheiro Golf at Casa Velha! 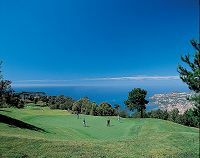 Listed Package Prices: Listed Golf Package prices apply with Unlimited Golf for 7 & 14 Night stays. All guestrooms at Madeira Island Hotel Casa Velha do Palheiro have en-suite bathrooms equipped with hairdryers and heated towel rails, TV, Central heating with individual control, Bathroom amenities of the highest quality. Double Garden Wing rooms are supplied with "Relais & Châteaux" products. Double Main House, Double Golf Wing rooms and Suites have "Molton Brown", direct dial telephone, Room safe, Mini bar, Welcome gift in all rooms on arrival, Writing desk with stationary set. The suites and superior rooms have additional separate shower cabins. Double Garden Wing Rooms - located in the Garden Wing adjacent to the main building. Emerald-green Virginia creeper smothers much of the pale peach façade of this accommodation wing, where ground- and first-floor rooms overlook the hotel entrance and afford pleasant rear-views across the gardens. Double Golf Wing Rooms - Fronting the hotel's well-manicured back lawn, the architecture of the two-tier Golf Wing is very much in keeping with Casa Velha's country house-style appearance. The Double Golf Wing Rooms offer more floorspace and bathrooms with separate tub and shower. The floor-length rear windows allow glimpses of the golf course. Senior Suites Golf Wing - The two Senior Suites located in the Wing are named after noted topographical painters Frank Dillon and Andrew Pickens. Both suites enjoy substantial floor space, with separate bedroom and lounge-sitting room. Bathrooms feature individual Whirlpool-bath and shower units. Double Main House Rooms - enjoy a period setting within the Old House. Bright and airy, the antique character is immediately inviting and delightfully informal. Decorated throughout in pastel hues, the muted tones accentuate the mahogany furnishings and decorative floral fabrics. Some of the rooms enjoy elevated views over the terrace and rear lawn. Junior Suites Main House - The three Junior Suites located in the Old House offer a rare combination of generous floorspace and ambient light. Dining Room – Serving an impressive Continental buffet breakfast spread tempts with an array of freshly baked pastries, assorted jams and spreads, cold cuts, and fresh fruit and juice. An English-style cooked selection provides a heartier option. In the evening enjoy a choice menu of the finest gourmet cuisine is matched by an enviable selection of Portuguese and international wines. Club House - Influenced by the Atlantic and inspired by the Mediterranean, enjoy the à la carte menu list of appetising starters, mains and desert while taking in the view of the 18th green, bay, mountains and Atlantic Ocean. Casa de Chá - enjoy a privileged position in Palheiro Gardens, right next to Palheiro Golf and Casa Velha do Palheiro country house hotel. Serving teas and coffee, soup, sandwiches and salads, and a wonderful selection of homemade cakes, pastries and ice creams for visitors to the gardens as well as light snacks and refreshments for golfers. The Pool Bar - This convenient facility serves both the hotel’s heated outdoor swimming pool area and the adjacent Palheiro Spa. Serving an assortment of nourishing and healthy snacks to be ordered poolside and the bar also offers a range of hot and cold refreshments. Funchal is just 10km from Casa Velha do Palheiro providing bars, restaurants and shopping. Palheiro Golf is on the doorstep of the hotel, with a superb Championship layout and offering privileged access to guests. 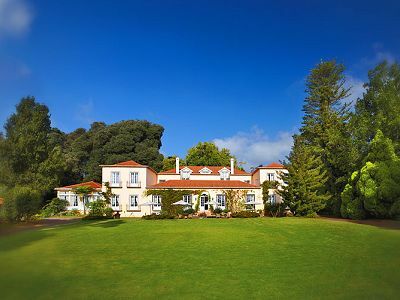 The hotel borders the world-renowned Palheiro Gardens – landscaped grounds that nurture an astonishing variety of rare and beautiful sub-tropical flora. Palheiro Golf is a beautiful layout with breathtaking views, fast undulating greens, well-placed bunkers and tight fairways that reward accurate play. The course winds around the Palheiro Estate which is famous for its pine forests, centennial trees, flowering shrubs and lush vegetation. Standout holes include the attractive 9th with its exotic trees and the spectacular par-five 18th where your elevated position in the fairway affords you views out to the Atlantic Ocean and tempts you to go for the heavily tree-lined green in two. Facilities include a six-hole academy course, chipping green with bunker, putting green and driving range. Flights, Car Hire/Transfers, Lunch and Dinner.